Food is great every time! Great atmosphere. Had family in from out of town. All enjoyed it. Great food. Great staff. Made us feel like regulars on our first visit. Good food good staff good surroundings! Definitely will be going back! Great bartender and food was excellent. Excellent food and great staff. The food is delicious and if you get there before 6:00 PM you can take advantage of the early bird specials. Consistently great food and service! Love Bowen's Landing. the food, the service is second to none! My husband and I love this place. It's our favorite restaurant in this area. My in laws came with us this past Friday and loved the food and staff as much as we do. We have tried almost everything on the menu and some of the specials and never leave disappointed. A little pricey. Awesome food, ribs were really good. The food was very good. Our server was quite pleasant. We'll go back. Party of 4 and 3 out of 4 were well satisfied. My rib eye was subpar as it was more gristly than marbely. Disappointing after the good things I had heard about this restaurant and the amount we paid for our meals. May give it another chance to change my opinion. One of my favorite places to eat. Excellent food, wonderful wait staff and friendly owners. The patio is beautiful with the stone fireplace. Have eaten here many times and the food is always good. Excellent steaks and seafood. A little bit more upper class dining than I expected. Not your regular fish camp setting. Food and service was good though. The wait was a little long, considering there weren't many people there and our group was small. Nonetheless, our food was good. Found a piece of gum in a napkin stuffed in the menu, though. Grossed me out. No thanks. 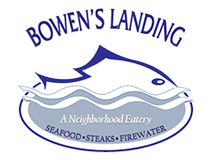 If you are in the area, you should definately try Bowen's Landing. The food and service are always good. The menu has a great selection and there are always daily specials. loved the atmosphere, the staff was super nice and polite. the food yes the food.... it was delicious with a capital D. my first time there but definitely not my last. One of my favorite places. Great food and great service. Connie is a wonderful bartender and Steve & Delores Bruce, the owners are great too. Great food and great selections! Great food and service! Stephanie and Tim are the best! Delicious food always with a great variety. The owners really care about their customers and quality. The service is always good with extra kudos for waitresses Caroline and Katy. The menu selections are many, the food is great and the servers are so friendly and quick to wait on us. Katie provided excellent customer service and the manager was very kind of professional! The food was a-m-a-z-i-n-g!!! The atmosphere was superb! I highly recommend this place - your wife or girlfriend will be pleased. Great food and great service!!! !would like to know if lunch is served? A bit pricey, but great for special occasions. Steaks & seafood were all delicious! Crab cakes were soooooo good. Service was outstanding. We will eat there often! Amazing!! Always good. We enjoy Bowens Landing A LOT! Love Love Love this establishment! Food is divine and sitting by the fireplace delightful. Fantastic Maker's Mark Manhattan and scallops. The service was great. A wonderful place for a party. Food was so amazing. I would definitely recommend the sirloin and crab cakes. The crab cakes are the BEST. Tracey and Tammy are great waiters as well. Great food, a nice atmosphere and price appropriate. Service from Katy was incredible & fast. The manger Tim was outstanding. Had the fish, collards, black eyed peas & fried okra. Their Tuesday night southern cooking is unreal.. my baby mama over here is now eating blackberry cobbler w/ ice cream & is now ignoring every word I say smh.. great place & we cannot wait to come back. We love this place, good food and good service. The owner or sometime the manager always comes to our table to thank us for our business and to make sure everything was as we expected. Always nice to know your business is appreciated. consistent great service and food at affordable price. we love it!